Properties in La Jolla Beach average 4.7 out of 5 stars. Adorable Cottage just blocks to Windansea Beach-great value! Property 6: Adorable Cottage just blocks to Windansea Beach-great value! Casita by the Sea, perfect for 2! Property 11: Casita by the Sea, perfect for 2! Sir Bacon’s Royal Respite, San Diego, Near Main and Dog Beach, Pet-friendly! 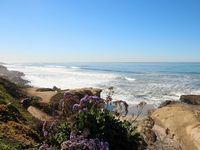 Property 22: Sir Bacon’s Royal Respite, San Diego, Near Main and Dog Beach, Pet-friendly! Stunning Beach Cottage 2 Blocks from Ocean. Just Remodeled. Property 26: Stunning Beach Cottage 2 Blocks from Ocean. Just Remodeled. Charming Beach Cottage! Steps to Beach/Food/Shopping! WiFi and Parking! Property 27: Charming Beach Cottage! Steps to Beach/Food/Shopping! WiFi and Parking! Property 28: Surf and Sun Cottage! Beach Daze 2: Steps from dog beach, walk to shops and restaurants. Property 30: Beach Daze 2: Steps from dog beach, walk to shops and restaurants. Steps to Beach w/ Amazing Views, Firepit, Hot Tub + Game Room! Property 31: Steps to Beach w/ Amazing Views, Firepit, Hot Tub + Game Room! You Can Walk To The Beach! Property 32: You Can Walk To The Beach! Perfection! Beautiful fully remodeled cottage w/AC, view, and steps to the sand! Property 36: Perfection! Beautiful fully remodeled cottage w/AC, view, and steps to the sand! Location, Location, Location...Quaint And Cozy And Close To All!! Property 38: Location, Location, Location...Quaint And Cozy And Close To All!! Ocean Beach Cottage - your perfect beach escape. Property 40: Ocean Beach Cottage - your perfect beach escape. Just steps to the ocean & bay, this luxurious home is better than a fine hotel! Property 41: Just steps to the ocean & bay, this luxurious home is better than a fine hotel! Smith's Cottage By The Beach - your little slice of heaven near the beach. Property 46: Smith's Cottage By The Beach - your little slice of heaven near the beach. It was a great place to stay so close to the beach!